The FSC certification reassessment audit of the PF Olsen FSC Group Scheme was undertaken at the end of March. The reassessment is an in-depth complete recertification audit carried out every five years, supported by intermediary annual audits which tend to be less comprehensive, but with a particular focus on specific aspects of the FSC Principles and Criteria. The March audit was conducted in the Bay of Plenty, Gisborne and Northland regions, with auditors from AsureQuality verifying that PF Olsen's forest management practices meet FSC standards. 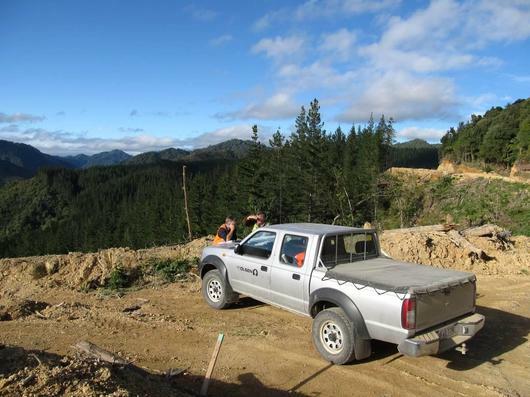 Time was spent both in the office and out in the field, where the auditors met a range of contractors doing silviculture, harvesting and roading activities. The auditors also inspected High Conservation Value Forests, erosion control areas and conducted a significant stakeholder consultation. Thanks to the ongoing work of FSC Group Scheme Administrator and Environment Manager Kit Richards and Environmental Forester Sally Haddon, only three minor non-conformances (NCR) and two observations (OBS) were identified by the audit team and most of these were rectified before the final audit process was completed.